My iPhone Home Button Won't Work! Here's The Real Fix. You are at:Home»iPhone»Buttons»My iPhone Home Button Won’t Work! Here’s The Real Fix. It’s easy to forget how often we use the Home button on our iPhones—until it stops working. Maybe your Home button never works, or maybe it only works some of the time. It’s frustrating either way, but there is good news: A lot of Home button issues can be fixed at home. 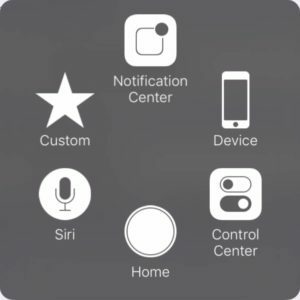 In this article, I’ll help you figure out why your iPhone’s Home button won’t work, how to use AssistiveTouch as a temporary solution, and some good repair options to fix a broken Home button if you can’t fix it yourself. Does My iPhone Need To Be Repaired? Not necessarily. Software problems and hardware problems can cause Home buttons to stop working. Software problems can usually be fixed at home, but if we find out your Home button isn’t working because of a hardware problem, I’ll recommend some great repair options for you to explore. First things first: Let’s make sure you can still use your iPhone before we move on to the fixes. How Can I Use My iPhone Without A Home Button? 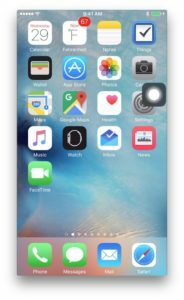 When a Home button won’t work, the biggest problem people face is that they can’t exit their apps and return to the Home Screen. Basically, they get stuck inside their apps. Fortunately, there’s a feature in Settings called AssistiveTouch that allows you to add a virtual Home button to your iPhone’s display. If you’re reading this article and you’re stuck in an app now, turn your iPhone all the way off and back on again. It’s a clunky fix, but it’s the only way. Go to Settings -> General -> Accessibility -> AssistiveTouch and tap the switch next to AssistiveTouch to turn it on. To use the Home button, tap the AssistiveTouch button on the screen , and then tap Home. You can use your finger to move the AssistiveTouch button anywhere on the screen. 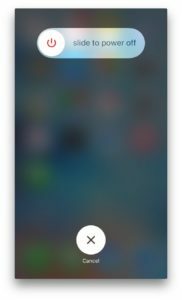 AssistiveTouch isn’t a real fix, but it is a good temporary solution while we figure out why your Home button isn’t working. If you need help turning it on, check out my YouTube video about how to use AssistiveTouch. Software problems occur when your iPhone doesn’t respond correctly when you press the Home Button. The hardware could be sending the signal, but if the software isn’t paying attention, nothing happens. When your iPhone’s software becomes corrupted, overloaded, or a helper program (called a process) crashes in the background of your iPhone, your Home button may stop working. In some cases, and especially where iPhones are used in dusty or dirty environments, the Home button can become less sensitive to touch. Don’t assume this is what’s going on if your Home button works intermittently (some of the time)—software problems cause this too. In my experience, the wear and tear issue affects pre-Touch ID iPhones (iPhone 5 and earlier) more than the current models. Smash! Your Home button isn’t where it used to be, or it’s a little “off-kilter”—this is relatively rare. The Home button is physically attached to your iPhone’s display, and two cables carry the Home button signal to the logic board. One cable runs runs through the top of the display and connects at the top of the logic board, and the other cable connects to the logic board underneath the Home button on the left. If your iPhone’s display was damaged or your iPhone got wet, one of the Home button cables or connectors may have been damaged too. Apple Store employees see iPhones with broken Home buttons all the time. I’d always check for damage first, then troubleshoot the software, and then repair the hardware if it was necessary. A general rule of thumb: If your Home button stopped working after your iPhone was physically damaged or got wet, your iPhone probably needs to be repaired—but not always. If it has gradually gotten worse over time or no major iPhone life event happened before it stopped working, we may be able to fix it at home. Click the Home button with your finger. Does it feel normal, or does it feel stuck? Gently move your finger from side to side—does the Home button feel loose? If it doesn’t feel the way it should, we may be dealing with a hardware problem—but if it has always felt “a little off” and it only recently stopped working, it could be an underlying software problem. Click the Home button on the very top. Does it work? Try the far left side, and then the bottom, and then the far right side. Try the corners. If it only works in some locations, like on the top but not on the bottom, you definitely have a hardware problem. There’s no fixing a Home button with a “directional” problem like this at home, but a lot of the people I worked with would choose simply to live with the problem now that they knew where to press the Home button. Take a close look at the Home button, your iPhone’s display, and inside the charging port and headphone jack on the bottom of your iPhone. Is there any physical damage or corrosion? Is it possible your iPhone got wet? Did other components (like the camera) stop working too, or is it only the Home button that’s having the problem? If you discover physical or liquid damage, it’s almost a sure bet that your Home button isn’t working because of a hardware problem, and your iPhone may need to be repaired — skip to the section called Repairing A Broken Home Button below. We’re heading into the software troubleshooting phase of the tutorial. As we discussed, your Home button may not work if your iPhone’s software doesn’t react the way it should when you press the Home button. If your iPhone has been very slow lately, apps have been crashing, or your Home button stopped working after you upgraded to a new version of iOS, a software problem may be the reason why your Home button won’t work. The first (and least invasive) software troubleshooting step is to turn your iPhone off and back on again. If you already rebooted your iPhone to turn on AssistiveTouch and that didn’t fix your Home button, just move on. When you turn your iPhone off, all the little programs that keep your iPhone running, one of which processes “events” like a Home button press, are forced to shut down. When you turn your iPhone back on, those programs start fresh again, and sometimes that’s enough to fix a minor software glitch. More significant software problems can only be fixed by restoring your iPhone, which means that you erase and reload all the software on your iPhone. If you make an appointment at the Genius Bar to fix a Home button and it’s not obviously a hardware issue, the tech will always restore your iPhone to make sure it’s not a software problem before making a repair. Back up your iPhone to iTunes or iCloud, and then follow these instructions to DFU restore your iPhone. DFU stands for “Device Firmware Update”, and firmware is the programming that controls how your iPhone’s hardware interacts with its software. Firmware is between hardware and software—get it? You won’t find instructions on how to DFU restore your iPhone on Apple’s website. It’s the deepest type of restore possible—if a DFU restore can solve a software problem, it will solve a software problem. My article about how to DFU restore your iPhone explains how to do it. Read that article and come back here when you’re done. After the restore finishes, you’ll be able to reload your personal information from your iTunes or iCloud backup, and the Home button problem should be solved for good. Anyone can replace your Home button, but only Apple can reenable Touch ID, the fingerprint sensor built into the Home button. Touch ID, which was introduced with the iPhone 5S, contains security features that link a specific Home button to a specific iPhone, and for security reasons, Apple is the only company who can crack the code. If you have a Touch ID-enabled iPhone and anyone other than Apple repairs your iPhone, the Home button will function just like it did before the iPhone 5S, without the Touch ID functionality. About half of the people I’d work with would choose to live with AssistiveTouch, the “software” Home button that lives on the iPhone’s display. It’s not a perfect solution, but it is a free solution. If you’re shopping for a new cell phone plan or you’re due for an upgrade, this may be the excuse you’ve been waiting for to upgrade to a new iPhone. A Home button that won’t work is one of the most frustrating problems that iPhone owners can face. AssistiveTouch is an excellent stopgap, but it’s certainly not a perfect fix. I hope you’ve been able to repair your Home button at home, but if you haven’t, I’d like to hear about which repair option you chose in the comments section below. Previous ArticleWhy Should I Switch To AT&T? The Best Switch To AT&T Promotion. Next Article My iPhone Won’t Connect to iTunes. The Real Fix For PC & Mac!